The My School website, myschool.edu.au, has been heavily discussed in the media and had 9 million hits on its first day! While the website experienced some initial technical difficulties, it is the comparison of ‘statistically similar schools’ via the Index of Community Socio-Economic Advantage (ICSEA) that has been most widely criticised. Deputy Prime Minister, Ms Julia Gillard claims that the website enables parents to make informed choices about their children’s schooling. However, informed choices are near impossible, without significant effort. In the field of usability, we’d say that the website does not meet with the users’ expectations, in this case parents, when trying to compare schools. Why have a website that lets you compare schools on an index that doesn’t make much sense to you or does not reflect the practical decision making process when it comes to choosing a school? Rather, the government has decided to provide parents with comparison data and a selection vehicle the government feel comfortable with. Naturally, parents will want to easily and quickly navigate the website. The My School website clearly prioritises a school search on its homepage. The only way in is by selecting a school from the list that appears. If you don’t select one, but type in a name yourself and press enter, the site doesn’t work. Usability best practice tells us, make sure people know exactly what they need to do before they do it. If this fails then the next way to help users proceed is to ensure error messaging is useful. The website doesn’t do this and this makes it even harder for parents. I thought, “Why can’t I just type in my postcode like Domain.com.au or Realestate.com.au and get a list of results presented? Or like 131500.com where a ‘did you mean’ question is used to pinpoint the address.” I guess the website really would rather you did not compare schools, geographically. While the website’s limited search functionality has been the centre of media attention (for fear that schools will be inappropriately compared), parents are only human and will ultimately want to compare schools according to their own basket of schools. Checking out one school in isolation seems reasonable but for parents looking to the website to help them make an ‘informed choice’ for selecting a school for their child, their needs are overlooked completely. Vast improvements could be made in comparing schools that are ‘statistically similar’. Most of the schools automatically shown in the search results are not even in the same state. A simple table would be able to show most of this data but the My School website lists only the names of the school and their performance so parents know nothing about the type of school that is performing better or worse, apart from that it’s ‘statistically similar’. And what does that really mean? For those interested in the definition of ‘statistically similar schools’ the site offers not one but two glossaries to explain this, adding further confusion. What parents really want is to compare a collection of local schools, or even better select a group of schools to compare between. Ideally, this comparison should also show more than just the ICSEA scores such as NAPLAN scores and facts about the school. Hoping to find this information on the local schools page proves to be a disappointment. There is no comparison data but only a simple list of local schools. Printing each school page to compare is not advised either, as every page prints with a large grey area at the end of it, quickly using up valuable ink and paper. An optimised print version via a printer icon on each page would enhance the site’s experience considerably. Of course, parents should be made aware and are clever enough to know that one school differs from another on many different factors, but how else are parents going to shortlist schools and make an ‘informed choice’ without greater flexibility in the search function? It’s inevitable that new websites will emerge that will give parents greater flexibility based on the data provided by the My School website. With a ‘real life’ comparison missing, the comparison tables presented are not particularly useful. None of the comparison tables allow parents to manipulate the data, such as sort or filter, to make it easier to interrogate and engage with. It is safe to say that the legends on the website are necessary to understand the tables, however, finding them is another story. Serious scrolling is involved. The colours sometimes blend in so much with the visual design of the website that it isn’t always obvious what they actually represent. Perhaps it can be made more obvious. Especially, white does not stand out at all. The use of an arrow icon (generally signifying a link) as a design element in the heading further compromises the user experience. Replacing the phrase ‘selected school’ with a more informal ‘this school’ would make the data more accessible. ize of the comparison tables! This is not a good result as the data is still too small! Equally it is impossible to see if the text can enlarge or decrease any more unless you click the icon a few times and realise nothing happens. It’s as though the icons are on the page because someone said they had to be but no-one actually understood why they are there! Perhaps it was imagined the website audience would simply look at the indicidual school data and ignore the rest. This is obvious when you look at the other pages. For instance, the Resources page shows a list of PDFs hiding valuable content within these. 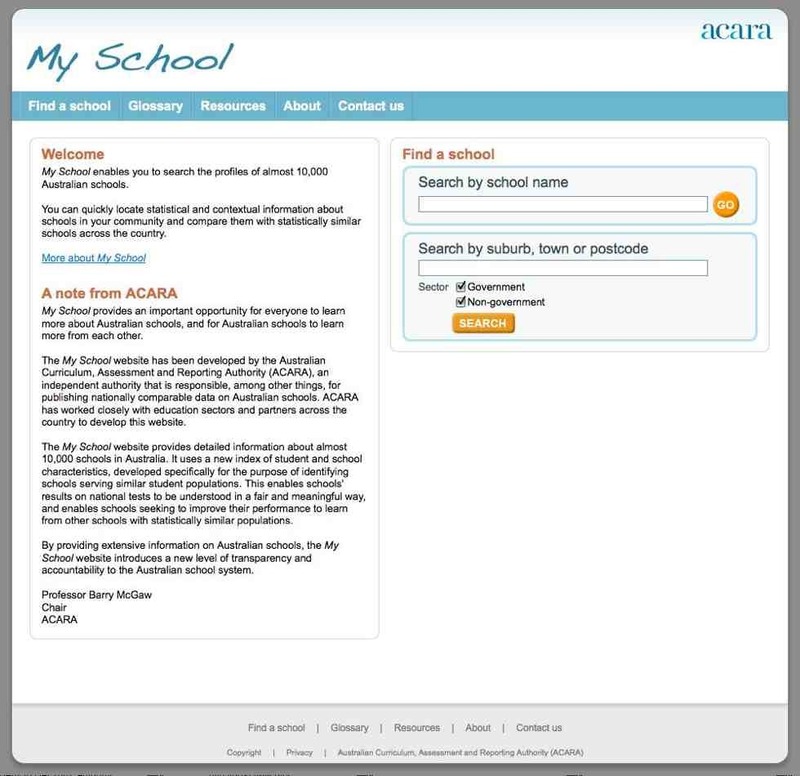 The About page does not say much about My School and could be bolstered with content from the ‘About the My School website’ PDFs on the Resources page. Overall, the idea of the My School site is great but its execution leaves room for improvement. Let’s hope some of our suggestions are included in their next update. Objective Digital is a Sydney based usability consultancy. This entry was posted in Uncategorized and tagged My School, myschool.edu.au, Site review, usability by Objective Experience. Bookmark the permalink. Plus My School is a trademark infringement on on http://www.myschoolact.com.au. Wouldn’t the government have thought to use their own IP register to check?